The invention concerns a washing or cleansing product portion, in particular to be placed in a washing machine or in a dish-washer to operate a programme in an aqueous phase. Said portion contains at least a measured amount of a preparation with detergent action and at least a water-soluble polymer material comprising the measured amount(s) of at least a preparation with detergent action. At least a constituent of at least one of the preparations with detergent action is also contained in the water-soluble polymer material and/or at least a constituent of the water-soluble material is also contained in one of the preparations with detergent action. The invention also concerns a package for such a portion of washing or cleansing product, and a washing or cleansing method. The present invention relates to a laundry detergent or cleaning composition portion with a new packaging, in particular with a water-soluble packaging, more particularly with a water-soluble at a given temperature packaging, but which is received with the ingredients of the detergent or cleaning dose no adverse interaction. The invention further relates to a new packing for washing or cleaning agent with respect to the prior art improved characteristics. Detergents and cleaning agents as well as methods for their preparation have long been known and are described in the prior art extensively. Usually washing or cleaning agents are provided to the consumer in the form of spray-dried or granulated solid products or as a liquid product. The consumer's desire for ways a convenient dosing following have been established in addition to these two classical variants products in pre-portioned form in the market and are also described in the prior art. Descriptions of detergents or cleaning agents, it can be found solid and / or liquid washing or cleaning agent in the form of pressed moldings, thus tablets, blocks, briquettes, rings and the like and packaged in bags portions. In the case of single-dose amounts of washing or cleaning agents that are packaged in bags enter the market, bags have enforced water-soluble film. These make tearing the package by the consumer unnecessary. In this manner is a convenient dosing of an individual, sized for a washing or cleaning operation portion by placing the pouch directly into the washing machine or dishwasher, particularly in de-ren dispensing compartment or by inserting the bag into a certain amount of water, for example in a bucket , a bowl or Handwaschbzw. -Spülbecken possible. The detergent or cleaner portion surrounding bag dissolves residue-free when it reaches a certain temperature. packed also in bags of water-soluble film detergents and cleaning agents are described in the prior art in great number. To disclose the earlier patent application DE 198 31 703, a portioned detergent or cleaning agent composition in a bag made of water-soluble film, in particular a bag made of (optionally acetaiisiertem) polyvinyl alcohol (PVAL), wherein at least 70 wt .-% of the particles of the detergent or cleaning agent preparation particle sizes of> 800 microns. The water content as well as the content of other components contained in the Foiienmaterial deals with the content of the surrounding air to water (humidity) and optionally other compounds into balance. The same happens between the film and the bag interior. In other words, it comes over time to set a phase equilibrium. = Humidity environment water content film Beuteiinneres = humidity. For the packaged product, this situation is almost equivalent to an open storage of the product in the ambient air. Especially in connection with the moisture or the water content of the film, this situation poses a problem and is especially in the case of the use of percarbonates as bleaching agents in the detergent or cleaning formulation undesirable. Percarbonates are in the presence of moisture for a period not stable, and by absorption of water, the activity of this component decreases considerably. Under conditions of a certain humidity so percar- are carbonate as bleach not stable in storage containing washing or cleaning agent preparations. Although the alternatively usable perborates are against dampness less sensitive than percarbonates, however, are not applicable because of esterification with the polyvinyl alcohol of the films. One known approach is to coat the water-soluble film material with a further, for example a vapor barrier layer, which results in a limited water vapor permeability of the packaging. For example, vapor barrier layers can be used to per- carbonate to protect from moisture. In another example, a mechanical and chemical separation of the outer package forming polyvinyl alcohol (PVAL) can be achieved by forming the esters with PVAL perborate by an additional layer on the inside of the package and the package can be stabilized. Thus, the publication WO 98/40464 (Unilever NV) describes combinations of at least one tablet of a compressed particulate washing or cleaning agent preparation with a this comprehensive closed package system comprising a water vapor transmission rate of less than 20 g / m 2 per day, ideaierweise of 5 g / m 2 per day. With this packaging system, an improvement of the physical properties of the packaged compressed tablet upon storage and improved dissolution of the tablet on contact with water to be achieved. The document EP-A 0,899,208 (The Procter & Gamble Company) describes combinations of washing or cleaning agent preparations in the form of a Stapeis of tablets containing a non-stable in a humid environment bleach, and a this comprehensive, non-water-soluble packaging with a water vapor transmission rate of less than 20 g / m 2 per day, ideally of 0.5 g / m 2 per day. The packaging consists for example of ten monolayers or coextruded or laminated films of polyethylene, polypropylene, polystyrene and / or polyethylene terephthalate. A significant disadvantage of these solutions described in the prior art is that the Hersteilung of a multiple (e.g., two) layers Foiienmaterials is costly and raises the price of the products not negligible. Secondly, the complete water solubility of the package is abandoned in favor of water vapor Impervious-ness regularly, which is also undesirable because of applicable packaging residue when washing or cleaning process. Alternatively to the above described proposals in the prior art, the use of an external vapor barrier outer packaging is obvious for moisture-sensitive and / or hygroscopic products. In order for the product to water or moisture ingress is then indeed well protected; in the package but provides a very low compared to the normal humidity equilibrium moisture. This is determined by the packaged detergent or cleaning agent preparation. The water-soluble film material, the water is almost completely withdrawn. This makes it brittle and mechanically sensitive. The washing or cleaning agent portions comprehensive bags can then even with careful handling tear through the consumer and the contents then pours into the vapor-barrier packaging. Thus, the benefits of a pre-packaged for direct use in a washing machine or dishwasher detergent or cleaner portion be removed in a water soluble film. Surprisingly, it has now been found that either when one detergent or cleaner ingredients which are also contained in the to extensive washing or cleaning agent, are incorporated in the water-soluble films, or when one washing or cleaning agent compatible plasticizers, which also contained in the water-soluble film, compounded in the detergent or cleaning agent, both ideal packaging materials for detergents or cleaning agents as well as practical and convenient metered washing or cleaning composition portions can be obtained which are encompassed by the above-mentioned packaging materials. The invention relates to a laundry detergent or cleaning composition portion, in particular for feeding a washing or dishwashing machine for a take place in an aqueous phase the program run, the at least one measured amount of at least one detergent active composition and at least one metered (s) amount (s) of at least contains a washing-active preparation complete water-soluble polymer material, wherein one or more component ^) one of the wash-active formulations are also included in the water-soluble polymer material at least. The invention relates in the same way, a washing or cleaning agent portion, in particular for feeding a washing or dishwashing machine for a take place in an aqueous phase the program run, the at least one measured amount of at least (a detergent-active composition and at least one (n) amount of the metered n) includes at least one washing-active preparation complete water-soluble polymer material, wherein one or more component (s) contained the water-soluble polymer material in at least one of the wash-active preparations. Moreover, the invention relates to an enclosure at least a measured quantity of a washing-active formulation of a suitable in particular for feeding a washing or dishwashing machine washing or cleaning composition portion in the form of a water-soluble polymeric material, wherein one or more component (s) at least one of the wash-active preparations are also included in the water-soluble polymer material. - comprises at least a measured amount of at least one washing-active preparation with the at least one water-soluble polymer material. - by addition of water and adjusting the temperature to a first temperature value at which at least a a measured quantity of a washing-active formulation of the washing or cleaning composition portion solves comprehensive water-soluble polymer material which releases at least one active washing formulation in the fleet; and optionally - by further addition of water (n) and adjusting the temperature to one or more other (s) temperature value (s) of / is higher than the first temperature value and is optionally further previous temperature values ​​/ are one or more further detergent-active preparations in the washing or cleaning liquor releases. The term "washing or cleaning composition portion" sufficient for a take place in an aqueous phase washing or cleaning operation quantity of a detergent or cleaning agent is understood in the context of the present invention. This can for example be a mechanical washing or cleaning operation such as with commercially available washing machines or dishwashers is performed. Erfmdungsgemäß but is also meant by this term (for example, in the hand basin or bowl performed) hand-washing course or manually performed Geschirrspülgang or any other act of washing or cleaning. washing or cleaning composition portions according to the invention, for example, for floor cleaning, glass cleaning, cleaning of fittings, facilities, equipment and surfaces in the kitchen, for cleaning fixtures, facilities, equipment and surfaces in the bathroom as well as hand washing ve are rwendet. According to the invention, the laundry detergents or cleaning composition portions are preferably used for machine washing or cleaning processes. The term "washing or cleaning agent-part portion" of a subset of a washing or cleaning agent portion is understood in the context of the present invention in a layer separate from other washing or detergent part-portions phase in spatial connection with other washing or cleaning composition portion servings the same detergent or detergent portion is present and prepared by suitable measures so that it can be separated from other detergent or cleaning agent-Teiiportionen same detergent or cleaning composition portion added to the liquor and, if appropriate dissolved or suspended in it. in this case, may be a detergent or detergent part-portion contain the same ingredients as another washing or cleaning agent Teiiportion same detergent or cleaning composition portion; alternatively, two washing or detergent part-portions thereof may detergent or cleaning composition portion different ingredients contain, in particular different detergent formulations. However, the invention also includes washing or cleaning agent-Por-functions with only one uniform composition washing or cleaning composition portion serving, for example, of powders, particles or moldings. According to the invention, the washing or cleaning agent portions contain measured amounts of washing-active preparations. It is possible that the portions contain only detergent-active preparations of a particular composition. preferred according to the invention, however, is that several, usually at least two active washing formulations of different composition are contained in the washing or cleaning composition portions. The composition may be different (quantitative) and / or with regard to the nature of the individual components of the active washing formulation (high) in terms of the concentration of the individual components of the washing-active formulation. It is particularly preferred that the components are adapted to the tasks regarding the type and concentration that have to comply with the detergent or cleaner part-portions in the washing or cleaning process. The Teiiportionen are preferred in the context of the present invention, the first, second and optionally third or even higher comprised of various water-soluble materials (fourth, fifth, etc.) measured amounts of one or more washing-active preparation (s), to a washing or cleaning agent -Portion are combined according to the invention. explained the term "detergent formulation" means preparations of all possible, relevant in the context of a washing or cleaning process substances in the context of the present invention. These are primarily the actual laundry detergent or cleaning agent with their more advanced in the broadest course of the description individual components. These include active substances such as surfactants (anionic, nonionic, cationic and amphoteric surfactants), builders (inorganic and organic builder substances), bleaching agents (such as peroxo bleaching agents and chlorine bleach), bleach activators, Bleichstabiiisatoren, bleach catalysts, enzymes , special polymers, dyes and fragrances (perfumes), without that the term be limited to these substance groups. There, the term "washing-active preparations" but understood washing aids and cleaning aids. Also laundry treatment agents such as Weichspüier or dishwashing additives such as rinse aid According to the invention considered as detergent preparations. According to the invention the washing or cleaning composition portion containing at least one metered (s) amount (s) at least one washing-active preparation complete water-soluble polymer material. Preferably, such a polymer material is a detergent composition comprising at least packaging. By this is meant an area or space-shaped structure which surrounds at least a measured quantity of a washing-active formulation completely least and thus a washing or cleaning agent part-portion forms the regularly (but not necessarily) in close spatial proximity to one another, optionally also by a water-soluble Veφackung included, but in any case metered amount of a further active washing formulation in the form of a washing or cleaning composition portion is arranged. The exact form of such Veφackung is not critical and can be widely adapted to the use conditions. There are, for example various forms (such as tubes, pillows, cylinders, cylinders, discs o. Ä.) Worked or processed plastic films or sheets, capsules or other conceivable shapes in question. According to the invention films, which can be glued for example to Veφackungen such as tubes, pillows o. Ä., And / or sealed after they are filled with partial portions of the inventive detergent or cleaning composition portion are. According to a preferred embodiment of the invention, the enclosure comprises a water-soluble polymer material. More preferably, the enclosure is a flat plastic part, even more preferably a plastic packaging. Preferred here are plastic capsules or bottles and more particularly to packaging in the form of a water-soluble polymer film. Among the plastic Folienveφackungen in turn are bonded and / or sealed plastic preferred Foiienveφackungen. Particularly advantageously, the enclosure is bonded with a water soluble adhesive water-soluble polymer film. Such films are known from the prior art in principle and originate, for example, the group of (optionally acetalized) polyvinyl alcohol, Poiyvinylpyrrolidon, water-soluble polyacrylates, water-soluble polyurethanes, poly-ethylene oxide, gelatin, cellulose and mixtures thereof. contain. Since the corresponding monomer, vinyl alcohol, in free form is not stable, (preferably methanol) polyvinyl alcohols of polymer-analogous reactions by hydrolysis, technically particularly by alkali-catalyzed transesterification of Polyvinyiacetaten with alcohols in solution. These technical methods also are accessible PVAL containing a reserved determinable residual content of acetate. The latter are sometimes "acetalized" as referred PVAL. Commercially available PVOH (eg Mowiol ® grades from Hoechst) are supplied as white-yellowish powders or granules with degrees of polymerization in the range of about 500 to 2500 (corresponding to molecular weights of about 10,000 to 100,000 g / mol) in trade and have different degrees of hydrolysis from about 70 mol%. For example, they have degrees of hydrolysis 98 to 99 and 87 to 89 mol%. so they are partially hydrolyzed polyvinyl acetates with a residual content of acetyl groups of about 1 to 2 and 11 to 13 mol%. The water solubility of PVOH may be obtained by after-treatment with aldehydes (acetalisation) reduce by complexation with Ni or Cu salts or by treatment with dichromates, boric acid, borax, and thus selectively adjusted to desired values. Films of PVAL are largely impermeable to gases such as oxygen, nitrogen, helium, hydrogen, carbon dioxide, but allow passage of water vapor. Examples of suitable water PVAL films under the name "SOLUBLON® ®" from Syntana Handelsgesellschaft E. Harke GmbH & Co. available PVAL films. Their solubility can water be adjusted to a precise degree and films of this product series are available, relevant in all for the application temperature ranges are soluble in the aqueous phase. PVP are prepared by radical polymerisation of 1-vinylpyrrolidone. Commercially available PVP have molecular weights in the range of about 2500-750.000 g / mol and are offered as white, hygroscopic powders or as aqueous solutions. the industrially by base-catalysed polyaddition of ethylene oxide (oxirane) generally containing small amounts of water are produced with ethylene glycol as Startmoiekül. They have molecular weights of about 200 5,000,000 g / mol, corresponding to degrees of polymerization n of ca. 5 to> 100,000. Polyethylene oxides have an extremely low concentration of reactive hydroxyl end groups and exhibit only weak glycol properties. Gelatine is a polypeptide (molecular weight: ca. 15,000 to> 250,000 g / mol) which is mainly obtained by hydrolyzing the collagen present in the skin and bones of animals under acidic or alkaline conditions. The amino acid composition of the gelatin largely corresponds to that of the collagen from which it was obtained, and varies as a function of its provenance. The use of gelatin as a water-soluble coating material is extremely widespread, especially in pharmacy in the form of hard or soft gelatin capsules. In the form of sheets of gelatin is rarely used because of its high price compared to the polymers mentioned above. also portioned in the invention washing and cleaning compositions, the pouch is made of water-soluble film consists of at least one polymer from the group of starch and starch derivatives, cellulose and cellulose derivatives, in particular Methylceliulose and mixtures thereof are preferred. Starch is a homoglycan in which the GIucose units are α-glycoside bonds. Starch is made up of two components of different molecular weight: from about 20-30% straight-chain amylose (molecular weight about 50,000 to 150,000. ), And 70 to 80% branched chain amylopectin, are deviated small (MW about 300,000 to 2,000,000.) amounts of lipids, phosphoric acid and cations. While amylose as a result of binding in 1, 4-position long, helical, forming chains containing about 300 to 1200 glucose molecules, the chain 6 binding branched amylopectin after an average 25 glucose units by 1, a branch-like structure containing about 1,500 to 12,000 glucose molecules. Besides pure starch of the present invention, starch derivatives, which are obtainable by polymer-analogous reactions of starch are useful for making water-soluble pouches in the frame. Such chemically modified starches include, for example, products of esterification or etherification reactions in which hydroxy hydrogen atoms have been substituted. However, starches in which the hydroxyl groups were against functional groups that are not attached by an oxygen atom replaced, can be employed as starch derivatives. for example, fall within the group of starch derivatives includes alkali starches, carboxymethyl starch (CMS), and Stärkeester - ether and amino. Pure cellulose has the formal empirical composition (C 6 Hιo0 5) n and, formally, is a beta-1, 4-polyacetal of cellobiose, which in turn is made up of two molecules of glucose. Suitable celluloses consist of ca. 500 to 5000 GIucose units and consequently have average molecular weights of 50,000 to 500,000. used as a disintegration agent based on cellulose are within the scope of the present invention, cellulose derivatives obtainable from cellulose by polymer-analogous reactions. Such chemically modified celluloses include, for example, products of esterification or etherification reactions in which hydroxy hydrogen atoms have been substituted. However, celluloses in which the hydroxy groups by functional groups that are not attached by an oxygen atom, can be replaced, used as cellulose derivatives. for example, fall within the group of cellulose derivatives, alkali metal celluloses, carbonyl xymethylcellulose (CMC), Celluloseester and ethers, and amino. Preferred enclosures water-soluble film comprised of a polymer having a molecular weight from 5000 to 500,000 Daltons, preferably 7,500 and 250,000 daltons and interlocutory in particular between 10,000 and 100,000 Dalton. The water-soluble film forming the enclosure, preferably has a thickness of 1 to 150 microns, preferably from 2 to 100 .mu.m, particularly preferably from 5 to 75 microns and especially from 10 to 50 .mu.m. These water-soluble films may be produced by various production processes. Here blowing, calendering and casting processes are in principle to name. In a preferred method, the films are blown starting from a melt with air via a blow mandrel into a tube. In the calendering process, which is also one of the preferred production process, the plasticized by suitable additives raw materials are sprayed to form the films. Here it may be particularly necessary to follow the spraying drying. In the casting process, which is also one of the preferred production process, an aqueous polymer composition is applied to a heated drying drum, after evaporation of the water is optionally cooled, and the film was peeled off as a film. Where appropriate, this sheet is additionally powdered before or during withdrawal. - one or more component (s) of the water-soluble polymeric material is / are also in at least one of the wash-active preparations contain. According to the invention, it is possible that either one of the two states is given, alternatively, that is either one or more component (s) at least one of the wash-active preparations is also contained in the water-soluble polymeric material is / are or that, alternatively, one or more components ^) the water-soluble polymer material is also contained in at least one of the wash-active preparations / are. However, it is also one of preferred embodiments is that both conditions are met simultaneously, ie that one or more component (s) of the detergent-active preparations is also contained in the water-soluble polymer material, both at least / are and that simultaneously one or more Kompoπente (n) of the water-soluble polymer material is also contained in at least one of the wash-active preparations / are. This corresponds to a particularly preferred embodiment of the invention, if both alternatives are given simultaneously. According to the invention with the fact that one or more Kσmponente (s) one of the wash-active preparations is also contained in the water-soluble polymer material is at least / and / or that one or more component ^) of the water-soluble polymer material in at least one of detergent-active preparations is / are achieved, that is set by the stage of the preparation of a phase equilibrium between the ingredients a detergent-active composition and the at least comprising them water-soluble polymer material. Although a continuous material exchange takes place between the two phases; not, however, this leads to exceeding the concentration of the phase equilibrium accumulation of / the respective substance (s) in one phase and a concomitant waste enrichment of / the respective substance (s) in a different phase, which regularly with an undesired change the respective characteristics is connected. The repeatedly observed changes in the properties of one or more ingredients (s) of one or more washing-active preparation (s) with respect to the properties such. For example, the washing or cleaning activity (in washing or cleaning methods and / or changes in the properties of one or more surrounding the detergent-active preparations enclosures) or Veφackung s) in terms of properties such. As the water solubility or brittleness, failed to materialize in the erfindungsgegmäßen washing or cleaning composition portion or in their enclosure. Basically, the fact that one or more component (s) at least one of the wash-active preparations is also contained in the water-soluble polymer material / and / or that one or more component ^) of the water-soluble polymer material in at least one of the wash-active preparations is / are not from the perspective of the respective components derived compelling restrictions contained in both phases imposed. So in principle eligible for installation in the / the water-soluble ^) polymer materiai (a) and the adjustment of a phase equilibrium between a washing-active preparation and a polymeric material compounded each of the components of the active washing formulation in question, just as for the single in the detergent (s) preparation (s) and the adjustment of a phase equilibrium between a polymer material and a detergent active composition each of the components of the polymer material is in question. According to the invention, however, certain ingredients of the respective phases of the equilibrium offer themselves to advantage. The main advantage is the fact that no further foil foreign substances must be incorporated into the film, creating a complicated manufacturing process and an increase in weight of the film as well as avoiding a rise in the cost of the film production. Further, certain ingredients then offer because a quick and advantageous adjustment of phase equilibrium can be achieved with respect to these substances and thus the advantages of the invention come to fruition quickly. However, this can also be that the substance contained in a special case, in two phases (washing-active preparation and water-soluble polymer material) can be conveniently incorporated in both phases. It corresponds to a further preferred embodiment of the invention, when in at least two stages to select substances contained such that - possibly less in additional amounts (<20 wt .-%, advantageously <10 wt .-%, based on the preparation) Water - be liquid at room temperature or pasty to waxy. Substances that are selected for this to be seen from an application perspective requirement lead to washing or cleaning agent portions with full activity of the wash-active substances and storage-stable, improved in properties enclosures. Particularly preferred is an embodiment of the washing or cleaning composition portions in which the contained also in the water-soluble polymer material (s) component (s) according to the invention is selected at least one of washing-active preparation (s) is / are selected from the group consisting of -ionischen and anionic surfactants, as defined in detail below. Olefin sulfonates, ie mixtures of alkene and hydroxyalkane sulfonates and disulfonates, considering how to 2 -i 8 monoolefins with terminal or internal double bond, for example, from Cι by sulfonation with gaseous sulfur trioxide and subsequent alkaline or acidic hydrolysis of the sulfonation products. Also suitable are alkanesulfonates, the 2-alkanes -ιβ chlorination or Ci example, by sulfo sulfoxidation be recovered and subsequent hydrolysis or neutralization. Likewise, the esters of 2-sulfo fatty acids (Estersul- sulfonates), for example, suitable are the 2-sulfonated Methylester of hydrogenated coconut, palm kernel or tallow fatty acids. Other suitable anionic surfactants are sulfonated Fettsäureglycerinester. Under fat säuregiycerinestem the mono-, di- and triesters and mixtures thereof are to be understood as in the production by esterification of a Monoglyce- rin with 1 to 3 mol fatty acid or in the transesterification of triglycerides with 0.3 to 2 moles of glycerol. Preferred sulfonated Fettsäureglycerinester the Sulfieφrodukte of saturated fatty acids having 6 to 22 carbon atoms, for example caproic acid, caprylic acid, capric acid, myristic are stinsäure, lauric acid, palmitic acid, stearic acid or behenic acid. Alk (en) yl sulfates are the alkali and especially the sodium salts of the Schwefelsäurehalbester Cι 2 -Cι 8 fatty alcohols, for example coconut fatty alcohol, tallow fatty alcohol, lauryl, myristyl, cetyl or stearyl alcohol, or the Cιo-C 2 o-oxoalcohols and those Halbester secondary alcohols of these chain lengths. Further preferred are alk (en) yl sulfates of said chain length which contain a synthetic, linear alkyl chain based on a petrochemical and which are similar in their degradation behavior to the corresponding compounds based on oleochemical raw materials. From the washing the C ^ -C ^ alkyl sulfates and C1 2 -C 15 are - alkyl sulfates and Cu-Cis alkyl sulfates are preferred. In addition, 2,3-alkyl sulfates, which are produced for example in accordance with US Patent No. 3,234,258 or 5,075,041 and can be obtained as commercial products from Shell Oil Company under the name DAN ®, are suitable anionic surfactants. Also, the Schwefelsäuremonoester the ethoxylated with 1 to 6 moles of ethylene oxide, linear or branched C 7 - 2 i-alcohols such as 2-methyl-branched Cg-n-alcohols containing on average 3.5 mol ethylene oxide (EO) or C 2 -ι 8 fatty alcohols with 1 to 4 EO, are also suitable. They are used only in relatively small amounts, for example in quantities of 1 to 5 wt .-% in detergents due to their high foaming. Other suitable anionic surfactants include the salts of Alkylsulfobern- acid, which are also known as sulfosuccinates or as sulfosuccinic acid esters and the Monoester and / or diesters of sulfosuccinic acid with alcohols, preferably fatty alcohols and especially ethoxylated fatty alcohols are represented. Preferred sulfosuccinates contain Cβ-iβ fatty alcohol residues or mixtures thereof. Particularly preferred sulfosuccinates contain a fatty alcohol radical derived from ethoxylated fatty alcohols which, considered in isolation, represent nonionic surfactants (see description below). Of these sulfosuccinates whose fatty alcohol radicals are derived from ethoxylated fatty alcohols with a narrow Homologenverteiiung particularly preferred. Likewise, it is also possible to use alk (en) yl succinic acid preferably containing 8 to 18 carbon atoms in the alk (en) yl chain or salts thereof. Other anionic surfactants in particular, soaps. Saturated fatty acid soaps such as the salts of lauric acid, myristic acid, palmitic acid, stearic acid, hydrogenated erucic acid and behenic acid, and in particular from natural fatty acids, for example coconut, palm kernel or tallow soap mixtures derived. The anionic surfactants including the soaps can exist in the form of their sodium, potassium or ammonium salts and as soluble salts of organic bases such as mono-, di- or triethanolamine. Preferably, the anionic surfactants are in the form of their sodium or potassium salts, especially in the form of the sodium salts. In a further embodiment of the invention, surfactants are used in the form of their magnesium salts. In the context of the present invention detergent and cleaning portions are preferred containing 5 to 50 wt .-%, preferably 7.5 to 40 wt .-% and in particular 15 to 25 wt .-% of one or more anionic Ten-sid ( e), in each case based on the detergent and cleaner portion. In the selection of the anionic surfactants, which are used in the inventive washing and cleaning composition portions, the formulation freedom are no basic requirements to restrictions in the way. However, preferred detergent and cleaner portions according to the invention have a content of soap, 0.2 wt .-%, based on the total weight of the washing and cleaning composition portion exceeds. Preferred anionic surfactants are the alkyl benzene sulfonates and fatty alcohol sulfates, preferred laundry detergent and cleaning composition portions 2 to 20 wt .-%, preferably 2.5 to 15 wt .-% and in particular 5 to 10 wt .-% of fatty alcohol sulfate (s) , based on the weight of the washing and cleaning composition portion included. Suitable nonionic surfactants 3 to 12 moles of ethylene oxide (EO) per mole of alcohol are preferably alkoxyiierte, advantageously ethoxylated or propoxylated, more particularly primary alcohols preferably containing 8 to 18 carbon atoms and on average 1 to 80, preferably employed in which the Alkohoirest linear or preferably can be may comprise methyl-branched in the 2-abutment condition or linear and methyl-branched residues in the mixture, as are typically present in oxoalcohol radicals. However, alcohol ethoxylates containing linear radicals of alcohols of native origin with 12 to 18 carbon atoms, for example coconut, palm, tallow fat or oleyl alcohol, and on average 1 to 80, preferably 2 to 8 EO per mole of alcohol. Preferred ethoxylated alcohols include, for example, Cι 2 -ι 4 alcohols containing 3 EO or 4 EO, n-alcohol with 7 EO, C. 13 15 - alcohols containing 3 EO, 5 EO, 7 EO or 8 EO, Cι 2 -ι 8 alcohols containing 3 EO, 5 EO or 7 EO and mixtures thereof, and mixtures of 2 Cι .ι 4 alcohol containing 3 EO and Cι 2 .i 8 alcohol containing 5 EO. The degrees of ethoxylation mentioned are statistical averages which may be an integer or a fractional number for a specific product. Preferred alcohol ethoxylates have a narrow homolog distribution (narrow range ethoxylates, NRE). In addition to these nonionic surfactants, fatty alcohols containing more than 12 EO may also be used. Examples are tallow fatty alcohol containing 14 EO, 25 EO, 30 EO, 40 EO or up to 80 EO. Another class of preferred nonionic surfactants, either as sole nonionic surfactant or in combination with other nonionic surfactants are alkoxyiierte, preferably ethoxylated or ethoxylated and propoxyiierte fatty acid alkyl ester, preferably having 1 to 8 carbon atoms in the alkyl chain and from 3 to 80 , preferably oxy to 20 alk-, preferably ethoxy groups in the molecule, especially fatty acid methyl ester, as are 58/217598 described for example in Japanese Patent application JP or which are preferably produced by the method disclosed in the international patent application WO-A-90/13533 method. Another class of nonionic surfactants which can be used to advantage are the alkyl polyglycosides (APG). Suitable alkyl polyglycosides correspond to the general formula RO (G) z, in which R is a linear or branched, methyl-branched, more particularly 2-position, saturated or unsaturated, aliphatic radical having 8 to 22, preferably 12 to 18 carbon atoms and G symbol, which stands for a glycose unit containing 5 or 6 carbon atoms, preferably glucose. The degree of glycosidation z is between 1.0 and 4.0, preferably between 1.0 and 2.0 and especially between 1, 1 and 1; 4. Preference is given to linear alkyl polyglucosides, ie alkyl polyglycosides in which the polyglycosyl a glucose unit and the alkyl group is an n-alkyl radical. The washing and cleaning agents according to the invention portions may preferably contain alkyl polyglycosides, contents of the detergent and cleaning composition portions APG than 0.2 wt .-%, based on the tablet as a whole, are preferred. Particularly preferred detergents and cleaning agents portions contain APG in amounts of 0.2 to 10 wt .-%, preferably upstream in amounts of 0.2 to 5 wt .-% and in particular in amounts of from 0.5 to 3 wt. -%. Nonionic surfactants of the amine oxide type, for example N-coconut alkyl N, N-dimethylamine oxide and N-tallowalkyl-N, N-dihydroxyethylamine oxide, and the fatty acid alkanolamide may be suitable. The amount of these nonionic surfactants is preferably not more than that of the ethoxylated fat alcohols, especially not more than half of them. is in which RCO is an aliphatic acyl radical having 6 to 22 carbon atoms, R ^ is hydrogen, an alkyl or hydroxyalkyl radical having 1 to 4 carbon atoms and [Z] is a linear or branched polyhydroxyalkyl radical having 3 to 10 carbon atoms and 3 to 10 hydroxyl groups. In the Polyhydroxyfett- acid amides are known substances which may be obtained by reductive amination of a reducing sugar with ammonia, an alkylamine or an alkanolamine and subsequent acylation with a fatty acid, a fatty acid or a fatty acid chloride usually. R-CO-N- [Z] (II) in which R is a linear or branched alkyl or alkenyl group having 7 to 12 carbon atoms, R 1 is a linear, branched or cyclic alkyl group or an aryl group containing 2 to 8 carbon atoms and R 2 is a linear, branched or cyclic alkyl group or an aryl group or an oxyalkyl group having 1 to 8 carbon atoms, wherein Cι ^ "alkyl or phenyl groups being preferred, and [Z] is a linear polyhydroxyalkyl residue, whose alkyl chain having at least two hydroxyl groups, or alkoxyiierte, preferably ethoxylated or propoxylated derivatives of this residue. [Z] is preferably obtained by reductive amination of a reduced sugar, for example glucose, fructose, maltose, lactose, galactose, mannose or xylose. The N-alkoxy- or N-aryloxy-substituted compounds may be converted WO-A 95/07331 by reaction with fatty acid methyl ester in the presence of an alkoxide as catalyst, into the desired polyhydroxy then, for example according to the teaching of the International Application. Still more preferred are the present invention non-ionic surfactants from the group alkoxyiierte fatty alcohols having 8 to 20 carbon atoms in the fatty alcohol radical, wherein fatty alcohols of natural origin, ie straight and regularly predominantly an even number of carbon atoms in the alkyl group-containing fatty alcohols, to synthetic fatty alcohols (e.g. . B. branched or an odd number of carbon atoms containing fatty alcohols) are preferred. Examples of the fatty alcohols from the viewpoint of availability of the compounds of lauryl alcohol (C 12), myristyl (Cu), cetyl alcohol (Ciβ), etc. and mixtures derived from natural sources. The number of alcohol xygruppen than that come into question in the first place or ethoxy Propoxygrup-pen, particularly preferably ethoxy, can vary within wide limits and is preferably between 3 and 80. Further nonionic surfactants which in the water-soluble polymer material may be included in the present invention are alkoxyiierte C 8 - to C 2 o - Fettsäurealky- esters having 1 to 8 carbon atoms in the alkyl radical and 3 to 80, preferably up to 20 alkoxy groups in the molecule, wherein the alkoxy groups are preferably ethoxy groups. From a practical point of view will be taken into account advantage that such compounds from the above groups are used, which are still liquid to pasty even with larger chain lengths at the application temperatures. It can be used in this invention for the purpose mentioned also preferred anionic surfactants. From the group of these compounds, alkyl benzene sulfonic acids are primarily having 9 to 13 carbon atoms in the Al kylgruppen and their (predominantly present in the alkaline environment) salts, Cu molsulfonsäure and their salts, fatty alcohol sulfates having from 12 to 18 carbon atoms in the fatty alcohol radical, and C 8 - to C 2 o - fatty acids and their salts. Further particularly preferred is an embodiment of the washing or cleaning composition portions in which the well in given by at least one washing-active preparation (s) component (s) according to the invention selected the water-soluble polymeric material is / are selected from the group of hydrophilic plasticizer. Particularly preferred are the present invention polyols having 1 to 20 carbon atoms and 2 to 6 hydroxyl groups, Polyalkyiengiykole having 2 to 4 (preferably linear) alkylene carbon atoms (ie, ethylene groups, Propyien- groups or butylene groups) in the molecule, particularly preferably polyethylene glycols and / or polypropylene glycols, more particularly preferably glycols polyethylene and / or polypropylene glycols having molecular weights ranging from 200 to 12,000 more preferably having molecular weights of <1,500. Also useful are advantageously the aforementioned polyalkylene glycols structurally analogous amino ne, ie compounds in which the glycol is replaced by an amine group -O- -NH- group. Also for the amines, the ranges stated above, the molecular weights apply. From a practical standpoint, such compounds are advantageously used, which are still liquid to pasty at the (higher) operating temperatures. Moreover, according to the invention an embodiment of the washing or cleaning composition portions preferable is contained in at least one washing-active preparation (s) component (s) of the water-soluble polymer material / are selected from the group of fragrances and Duftstoffzubereitun- gene ( perfumes). Suitable perfume oils or fragrances include individual fragrance can be used compounds, for example synthetic products of the ester, ether, aldehyde, ketone, alcohol and hydrocarbon type. Fragrance compounds of the ester type are, for example, benzyl acetate, phenoxyethyl isobutyrate, p-tert-butylcyclohexyl acetate, Linaiylacetat, dimethylbenz-yl carbinylacetat, Phenylethyiacetat, Linaiylbenzoat, benzyl, nylglycinat Ethyimethylphe-, Allylcyclohexylpropionat, Styrallylpropionat and Benzylsaiicylat. The ethers, for example, benzyl. The aldehydes include count. For example, linear alkanals having 8 to 18 carbon atoms, citral, citronellal, Citronellyloxyacetal- dehyde, cyclamen aldehyde, hydroxycitronellal, Lileai and bourgeonal. The ketones include the ionones, α-isomethylionone, and methyl. The alcohols include anethole, citronellol, eugenol, geraniol, linalool, phenylethyl alcohol and Teφineol. The hydrocarbons mainly include Teφene such as limonene and pinene. Mixtures of different fragrances are preferably used which are matched to one another that they together produce a pleasing fragrance note. Such perfume oils can also contain natural odorant mixtures, as are obtainable from plant sources. Examples are pine, citrus, jasmine, patchouli, rose or ylang-ylang oil. Also suitable are nutmeg oil, sage oil, Kamilienöl, clove oil, lemon balm oil, mint oil, cinnamon leaf oil, lime blossom oil, juniper berry oil, vetiver oil, galbanum oil and laudanum oil and orange blossom oil, neroli oil, orange peel oil and sandalwood oil. According to another preferred embodiment of the invention, low molecular weight polyacrylates or polymethacrylates or polymaleates can (acids or - in the alkaline conditions of use, preferably salts thereof, including their amine or (organic) ammonium salts) may be used or Copo- mers of polyacrylates / polymethacrylates and Polymaleinaten. The concentrations of the respective compounds in the respective phases, that is, the / the washing-active preparation (s) and in the / these extensive the water-soluble polymer material (s) depend entirely on the specific case. The concentration values ​​are, of course, influenced by the character of the current in the two candidate phase material, optionally interactions of two or more of present materials whose respective / relevant interaction (s) with the other components of the respective phase, the temperature, pressure and optionally further parameters. In general, the phase equilibrium concentration in one of the two candidate phases 0.5 to 50 wt .-%, based on the total weight of the respective phase, preferably from 1 to 30 wt .-%, and more preferably 3 to 25 wt .-% , Decisive for the concentration of a substance in question is only that a phase balance of the concentration of the particular substance (s) is established between the phases in which the properties of the detergent-active preparation (s) on the one hand and the / the water-soluble Poiymeimaterials / Polymerma-terialien on the other hand are in a desirable range. According to the invention it is of course also possible for the washing or cleaning composition portion and / or their enclosure or a partial portion comprehensive enclosure be designed so that one of the two phases no later in equilibrium the expected characteristic (s) rendered substances but contains, the other phase so much that during a controlled time setting (for example, hours or a few days), a phase equilibrium between the two phases (at least one washing-active preparation and / or at least one enclosure), without the corresponding substance in the phase in which it initially contained, is so greatly depleted that its desired or already optimized properties deteriorate unacceptably, or without changing the properties of the phase, not in the initially the corresponding substance or in a temperature below the equilibrium concentration Volume is so strong ver deteriorate, that a subsequent adjustment of a phase equilibrium does not improve the properties in an acceptable level. In this case, while one or more other substance (s) is incorporated only in the other phase / may be / may also be one or more component (s) can be incorporated only in one of the two phases. After bringing together of the two phases in the course of preparation of the inventive detergent or cleaning composition portion by filling one or more washing-active preparations) in one or more enclosure (s) then turns of one or more water-soluble polymer material (s) controlled by diffusion or Adsoφtionseffekte a phase equilibrium for the particular substance in the two phases (washing-active substance or water-soluble polymer material) that does not adversely affect the desired properties of the two phases even after prolonged storage. In the washing and cleaning agent portions according to the invention, consisting of a water-soluble polymer material enclosures of the washing-active preparation (s) selected from the group consisting of films, capsules and coatings. According to the invention particularly preferably polyvinyl alcohol films are as enclosure for the at least one washing-active formulation. The PVAL films preferably used are soluble in cold water temperature, ie at about 12 to 18 ° C. According to a further preferred embodiment, the PVOH films used are soluble at a temperature in a range that corresponds to the temperature range of the washing cycle or cleaning cycle, in which the respective measured quantity of a washing-active preparation is used. This is for example in the case where the candidate measured quantity of a washing formulation is a preparation for the Hauptspüigang a dishwasher, the temperature of the main, for example in the range of> about 20 to about 55 ° C, preferably> 25 ° C to under 45 ° C, more preferably at a temperature above 30 ° C up to for example 40 ° C. In the case where, for example, the respective measured quantity of a washing-active preparation is a preparation for the rinse cycle of a dishwasher, is the temperature at which the film is water soluble, at the temperature of Nachspülgangs and is, for example> 45 ° C, for example. Example in the range of 50 to 55 ° C or even higher. In coordination with the requirements and customary mode the device other temperature ranges apply to washing process in washing machines, for example, to about 25 ° C for the pre-wash, to about 90 ° C for the main wash and to about 30 ° C for the subsequent wash. Of course, the temperatures at which the water-soluble film dissolves, be adjusted within wide ranges and are film materials are commercially available (see. The sheets of the MOWIOL ® -type above or the films above the SOLUBLON ® -type), the are set to a certain range the temperature of the water solubility; the skilled person may then select according to requirements and to incorporate the components in such films or admit them by adjusting the phase equilibrium, which are used according to the invention in the films, such films. It corresponds to a further preferred embodiment of the invention that the water-soluble material, which comprises the respective measured quantity of a washing formulation, a water-soluble capsule. Such capsules are also known in the prior art. You can, for example, without this being intended to be limiting, be capsules of PVAL, gelatine or similar materials. Such capsules are commercially available and are widely used in connection with pharmaceutical preparations or food additives. have proved particularly hard gelatin capsules or soft gelatin, and are therefore inventively particularly preferred. In a further, likewise preferred embodiment of the invention, the respective measured quantity of a washing-active formulation comprising water-soluble material is a water-soluble coating. Such coatings or coating substances are already used for wrapping washing-active substances in the prior art and can be - comparable to the film materials - in terms of their physical properties, such as for water solubility, melting point or melting range precisely adjusted to specific technical requirements. For the purposes of the present invention are for enclosing detersive compositions Coatings that are water soluble in the narrower sense, as well suited as coatings, which disintegrate in an aqueous environment at setting of specific physical or chemical conditions, such as at a specific temperature or a specific pH because, for example, melting and the coating substances are then dispersed in water and the ingredients previously provided with the wrapping or enclosure, that is, the detergent active release (n) preparation (s). In this sense, the term "water-soluble" in the present invention is generally not only the property of the enclosures of the detergent-active preparations to be dissolved by an aqueous medium (in the narrow sense) but also the property (in a broad sense), at to change setting of specific physical or chemical conditions in the aqueous environment so that the physical integrity is lost and the enclosure to release the ingredients in the aqueous phase. the melting and subsequent dispersing the material of the enclosure in the aqueous phase is a typical (but non-limiting ) example. In principle, the coatings or coating substances should have a melting range in such a temperature range, in which the product to be wrapped washing-active substances are not exposed to high thermal stress. On the other hand, the melting range must be sufficiently high to have sufficient protection for the enclosed wash-active substances to offer at least slightly elevated temperature. Preferably, the substances of the coatings or the coating substances have melting ranges of which lie between about 45 ° C and about 75 ° C. The term "melting range" in this case means that the melting range occurs within the stated temperature interval, and does not indicate the width of the melting range. As a particularly effective Coatings have proved of waxes in this context, when applied directly to the washing-active preparation or its individual components be, and such coatings are therefore due to the ease Aufbringbar- resistance and the ability to adjust the Wasseriöslichkeit accurately and optimally adapted to the circumstances and allow an adjustment of a phase equilibrium between enclosure and Covered washing-active preparation, particularly preferred. "Waxes" is a series of natural or synthetic substances understood that above 40 ° C generally melt without decomposition and have little are relatively low viscosity and not stringy above the melting point. They have a highly temperature-dependent consistency and solubility. According to their origin the waxes are divided into three groups, namely natural waxes, chemically modified waxes and synthetic waxes. The natural waxes include, for example, plant waxes such as Can- delillawachs, carnauba wax, Japan wax, Espartog raswachs, cork wax, Guarumawachs, rice germ oil wax, sugar cane wax, ouricury or montan wax, animal waxes such as beeswax, shellac wax, spermaceti, lanolin (wool wax), or uropygial fat, mineral waxes such as ceresin or ozokerite (earth wax) or petrochemical waxes, such as petrolatum, paraffin waxes or micro- rowachse. The chemically modified waxes include hard waxes such Montanesterwachse, Sassoiwachse or hydrogenated jojoba. Synthetic waxes lyalkyienglykoiwachse are understood to be polyalkylene waxes or polyvinyl. usable as wrapping materials or coatings are also compounds from other substance classes which meet the above requirements with regard to the softening point are. As suitable synthetic compounds have, for example, higher esters of phthalic acid, in particular dicyclohexyl phthalate, commercially available under the name Unimoll 66 ® (Bayer AG) is available, proven. Also suitable are synthetic waxes made of lower carboxylic acids and fatty alcohols, for example Dimyristyltartrat sold under the name Cosmacol ® ETLP (Condea) is available. Conversely, synthetic or partially synthetic esters of lower alcohols with fatty acids from native sources are usable. In this class, the product Tegin ®, for example, falls 90 (Goldschmidt), a glycerol mono stearate-palmitate. Also shellac KPS three-ring-SP (Kalkhoff GmbH Company) according to the invention can be used as shell material or coating. Also covered by waxes within the scope of the present invention, for example, the so-called wax alcohols. Wax alcohols are relatively high molecular weight, water-insoluble fatty alcohols having generally from about 22 to 40 carbon atoms. The wax alcohols occur, for example in the form of wax esters of relatively high molecular weight fatty acids ( "wax acids") as the main constituent of many natural waxes. Examples of wax alcohols are lignoceryl (1-tetracosanol), cetyl alcohol, Myristylalkohoi or melissyl. The coating of the active washing formulations may optionally also contain wool wax alcohols, by which is understood Triteφenoid- and stero-idalkohole, for example, lanolin, for example, under the trade designation Argowax ® (company Pamentier & Co.) is obtainable. also, at least partially, be used as shell material in the present invention Fettsäureglycerinester or fatty acid alkanolamides, but optionally also water-insoluble or only slightly water-soluble Polyalkylengly-kol compounds. preferably, in accordance with the invention used Coatings the coating substance predominantly paraffin wax. further preferred are at least 50 wt .-% of the total e nthaltenen coating substances, even more preferably more, paraffin waxes. Particularly suitable are paraffin wax contents (based on the total coating substance) of about 60 wt .-%, about 70 wt .-% or about 80 wt .-%, even higher contents of for example more than 90 wt .-%, particularly preferably are. In a more particular embodiment of the invention, the total amount of coating substance employed paraffin wax. Paraffin waxes have, compared to the other mentioned natural waxes in the context of voriiegenden invention has the advantage that in an alkaline detergent or cleaner environment no hydrolysis of the waxes occurs, as is to be expected, for example, with wax esters because paraffin wax does not contain any hydrolyzable groups. Paraffin waxes consist mainly of alkanes and small amounts of iso- and Cycioalkanen. The preferred to use paraffin waxes have substantially no constituents with a melting point greater than 70 ° C, particularly preferably more than 60 ° C. High-melting alkanes in the paraffin wax can leave unwanted wax residues on the laundry to be washed or leave the material to be cleaned at below the melting temperature in the detergent or cleaner fleet. Such wax residues lead to an unattractive appearance of laundry or cleaning items and should be avoided. The shell substances used in the present invention comprise a paraffin wax having a melt realm of 50 ° C to 60 ° C.
Preferably, the content of the paraffin wax used is at ambient temperature (about 10 to about 30 ° C) solid alkanes, isoalkanes and Cycioalkanen as high as possible. The more solid wax constituents present in a wax at room temperature, the more useful it is in the context of the present invention. With increasing percentage of solid wax constituents, the resilience of the coated particles with the shell material to impact and friction with other surfaces, leading to a better protection of the surfactants contained in the particles increases. The coating substance can in addition paraffin waxes as a main component one or more of the above-mentioned waxes or wax-like substances. Basically, this should be such as the enveloping substance or mixture forming the coating, so that the coated particles are at least substantially water-insoluble. The solubility in water should not exceed about 10 mg / l at a temperature of 30 ° C and should preferably be at 5 mg / l. In each case, the enclosure should have a very low Wasseriöslichkeit in water at elevated temperatures in order to avoid a temperature-independent release of the active detergent substances as much as possible. The principle mentioned above is used for the delayed release of active washing formulations at a given time in the washing or cleaning process and can be applied particularly advantageous if (for example, 45 ° C) is flushed, for example, in dishwashing in the main passage at a relatively lower temperature, so that the washing-active substance is from a rinse agent comprising coated particles only in the rinse cycle at higher temperatures (eg. B.> 55 ° C) released. In the invention, coating substances or coatings used preferably include one or more substances having a melting range from 40 ° C to 75 ° C in amounts of 6 to 30 wt .-%, preferably from 7.5 to 25 wt .-% and in particular 10 to 20 wt .-%, each based on the Teilcheπgewicht. It corresponds to a further preferred embodiment of the invention that the washing or cleaning composition portion in which one or more compo- nent (s) at least one of the wash-active preparations is also contained in the water-soluble polymer material / and / or in the one or more component (s) is the water-soluble polymer material in at least one of the wash-active preparations / are additionally comprises an enclosure or Außenumfassung which (in a particularly preferred embodiment for steam and / or for the present the phase equilibrium in each case n) or the setting of a phase equilibrium unteriiegende (s) component (s) is less permeable than the detergent active (s) preparations) immediately surrounding (n) enclosure (s). This additional enclosure can be a comprehensive alone a detergent or cleaner portion enclosure or may be a multiple washing or cleaning agent portions be comprehensive enclosure. Several cleaner portions can be offered in "PortionPack" the consumer so to speak, that's not only a transport-related problem of simultaneous delivery of several (eg, six, ten or more.) Washing or cleaning composition portions is released. The latter case is preferred but also achieved an optimal protection of the individual washing or cleaning composition portions against exchange with steam or substances from the interior of the enclosure or substances from the environment. a particularly long shelf life can be guaranteed. the permeability of these additional enclosure for water and for according to the invention voriiegende in phase equilibrium (s) component (s) may well be different from this,. so it is possible that the transmittance of one or more of the components (if any) is slightly larger or smaller than for water further preferred is an embodiment of the invention be, i the open such an additional enclosure to and removal of one or more detergent or detergent portions is reclosable. This can be ensured in the prior art known per se, for example as described in the document EP-A 0 899 208. The person skilled in this field of Veφa- ckungstechnik knows such means for re-closing such an enclosure and it may according to his Select expertise without limitation. More preferably, it is according to the invention to use a Außenumfassung according to the present description, which has only a limited permeability to water vapor. Desired, and used in the invention with particular advantage enclosures have a moisture vapor permeability of <10 g / m 2 per day at 23 ° C and 85% rel. Moisture, more preferably a water vapor permeability of <5 g / m 2 per day. Particularly preferred are Außenumfassungen which have no measurable water vapor permeability as measured according to DIN EN 53,122th Suitable materials for this purpose are also known from the prior art. This can, for example, without limitation, single-layer, multi-layer terephthalate, laminated or co-extruded films of materials such as polyethylene, polypropylene, polystyrene, Polyethylente-, copolymers thereof, or mixtures thereof. Particularly advantageous are polyethylene or polypropylene films with one or more layers. In the washing or cleaning composition portions according to the invention are preferably a plurality of, for example, first, second and possibly higher (third, fourth, etc.) measured quantities of washing-active preparations each independently formköφerartige, powdery, gel-like or liquid detergent or cleaning agent formulations. Here can formköφerartige washing or cleaning agent preparations are present as granules, tablets, blocks, briquettes, rings or other molded body; in particular, tablets, blocks or briquettes, the wells, recesses, grooves o. ä. have, which serve to accommodate particular components of the preparations or up also for technical purposes or have been attached can be uniformly shaped or Köφer Köφer. Liquid washing or cleaning agent preparations may be solutions, suspensions or other known for washing and cleaning purposes liquid systems. The washing and inventive cleaner portions include one or more substances from the group of surfactants, surfactant compounds, builders, bleaches, bleach activators, enzymes, foam inhibitors, dyes and fragrances, as well as - in the case that the washing or cleaning composition portions at least partly present as a molded body - binding and disintegration auxiliaries. These classes are described below. To the development of washing performance and washing the inventive cleaning composition portions may contain surface-active substances from the group of anionic, nonionic, zwitterionic or cationic surfactants, anionic surfactants are much preferred for economic reasons and because of their power spectrum. The anionic usable in the inventive detergents or cleaning composition portions and non-ionic surfactants have already been broadly described above. As indicated, the use of anionic surfactants is preferred. Furthermore, it may be preferred to use cationic surfactants in addition to anionic and nonionic surfactants. They are used preferably as Waschleistungsbouster, with only small amounts of cationic surfactants are required. When cationic surfactants are used, they are preferably present in the compositions in amounts of from 0.01 to 10 wt .-%, particularly from 0.1 to 3.0 wt .-%. In cases where there is detergent in the inventive detergents and cleaning composition portions, these usually comprise one or more surfactant (s) in total amounts of from 5 to 50 wt .-%, preferably in amounts of from 10 to 35 weight .-%, and may be included in greater or lesser amount in portions of the inventive laundry detergent portions surfactants. In other words, the amount of surfactant is not equal in all sub portions; rather, part portions with relatively larger and part-portions relatively smaller (or no) surfactant content can be provided. In cases where there is cleaning agent in the inventive detergents and cleaning composition portions, in particular dishwashing detergent, these usually comprise one or more surfactant (s) in total amounts of from 0.1 to 10 wt .-%, preferably in amounts of from 0.5 to 5 wt .-%, and may be included in greater or lesser amount in portions of the inventive cleaning composition portions surfactants. In other words, the surfactant is not in all sub portions even with cleaning and dishwashing detergents same; rather, part servings relatively larger and divided portions can be seen-with relatively smaller (or no) surfactant. In addition to washing substances, builders are the most important ingredients of detergents and cleaning products. In the inventive washing and cleaning composition portions of the builders typically used in detergents and cleaning agents can be included, ie in particular zeolites, silicates, carbonates, organic cobuilders and - where there are no ecological objections to their use - also the phosphates. Can also be used amoφhe Natriumsiiicate with an Na 2 θ are: SiO 2 of 1: 2 to 1: 3.3, preferably 1: 2 to 1: 2.8 and more preferably 1: 2 to 1: 2.6, which dissolve with delay and exhibit multiple wash cycle properties. The delay in dissolution compared with conventional amoφhen sodium silicates can have in different ways, for example by surface treatment have been caused by over-drying compounding, compaction / compression or. In this invention, is meant by the term "amoφh" and "röntgenamoφh". This means that the silicates ray diffraction experiments, provide no sharp X-ray, which are typical of crystalline substances, but at best one or more maxima of the scattered X-radiation which have a width of several degrees of the diffraction angle. However, it may very well even lead to particularly good builder properties if the silicate particles produce crooked or even sharp diffraction maxima in electron diffraction experiments. This is to inteφretieren so that the products have microcrystalline regions the size of 10 to several hundred nm, with values ​​up to max. 50 nm and especially up to max. 20 nm are preferable. Such so-called röntgenamoφhe silicates, which also dissolve with delay in relation to conventional waterglasses, are described for example in German patent application DE-A-44 00 024th Particularly preferred verdichte- te / compacted amoφhe silicates, compounded amoφhe silicates and over dried röntgenamoφhe silicates. can be described. Suitable zeolites have a mean particle size of less than 10 .mu.m (volume distribution; measurement method: Coulter Counter) and preferably contain 18 to 22 wt .-%, preferably 20 to 22% by weight of bound water. Of course, in detergents also use the commonly known phosphates as builder substances is possible, provided such a use should not be avoided for ecological reasons. Particularly suitable are the sodium salts of the orthophosphates, the pyrophosphates and especially the tripolyphosphates. Useful organic builders are, for example usable in the form of their sodium salts polycarboxylic acids, with such carboxylic acids are understood to polycarboxylic acids which carry more than one acid function. For example, these are citric acid, adipic acid, succinic acid, glutaric acid, malic acid, tartaric acid, fumaric acid, sugar acids, aminocarboxylic acids, nitrilotriacetic acid (NTA), provided their use is not objectionable on ecological grounds, and mixtures thereof. Preferred salts are the salts of polycarboxylic acids such as citric acid, adipic acid, succinic acid, glutaric acid, tartaric acid, sugar acids and mixtures thereof. The acids per se can be used. The acids Besides their builder effect also typically have the property of an acidifying component and, hence, also serve to a relatively low and mild pH value in detergents and cleaning agents portions of adjustment according to the invention. Citric acid, succinic acid, adipic acid, gluconic acid and mixtures of these of these in this context. As builders, polymeric polycarboxylates are also suitable. These are for example the Alkaiimetallsalze of polyacrylic acid or polymethacrylic acid, for example those having a relative molecular mass of 500 to 70,000 g / mol. At the indicated for polymeric polycarboxylates molecular weights are within the scope of the present invention are weight average molecular weights Mw of the particular acid form which, basically, were determined by gel permeation chromatography (GPC) using a UV-detector. The measurement was made against an external polyacrylic acid standard, which owing to its structural similarity to the polymers under investigation, provides realistic molecular weight. These figures differ significantly from the molecular weights measured against polystyrene sulfonic acids as standard. The measured against polystyrene acids Moimassen are significantly higher than the molecular weights mentioned in the context of the present invention generally. Particularly suitable polymers are polyacrylates which preferably have a molecular weight of 2,000 to 20,000 g / mol. Because of their superior solubility, the short-chain polyacrylates which have molecular weights of 2,000 to 10,000 g / mol in this group may in turn be preferable, particularly preferably of 3,000 to 5,000 g / mol. Also suitable are copolymeric polycarboxylates, especially those of acrylic acid with methacrylic acid or of acrylic acid or methacrylic acid with maleic acid. Particularly suitable copolymers of acrylic acid have been found with Maieinsäure which contain from 50 to 90 wt .-% acrylic acid and 50 to 10 wt .-% of maleic acid. Their relative molecular weight, based on free acids, is generally from 2000 to 70,000 g / mol, preferably 20,000 to 50,000 g / mol, and especially 30,000 to 40,000 g / mol. 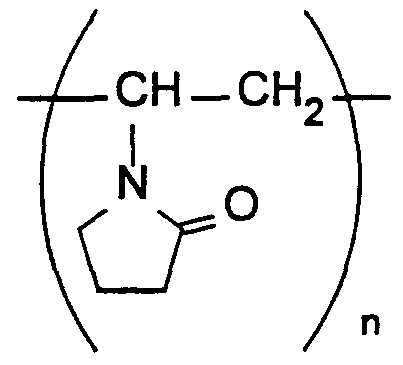 The (co) polymeric polycarboxylates can be used either as a powder or as an aqueous solution. The content of the inventive washing or cleaning composition portions (co) polymeric polycarboxylates is preferably 0.5 to 20 wt .-%, in particular 3 to 10 wt .-%. In order to improve the water solubility of the polymers can also Allyisulfon- acids containing, for example in EP-B 0727448, Allyloxybenzoisulfonsäure and methallyl sulfonic acid as monomer. In particular, biodegradable polymers preferably from more than two different monomer units, for example, those according to DE-A 43 00 772, as monomers, salts of acrylic acid and maleic acid and vinyl alcohol or vinyl alcohol derivatives, or according to DE-C 42 21 381 as monomers, salts of acrylic acid and 2-alkylallyl sulfonic acid and sugar derivatives. More preferred copolymers are those that are described in German patent applications DE-A 43 03 320 and DE-A 44 17 734 and as monomers preferably contain Acroiein and acrylic acid / acrylic acid salts or acrolein and Vinyiacetat. Other preferred builders are polymeric aminodicarboxylic acids are, to their salts or precursors thereof. Particularly preferably polyaspartic acids or their salts and derivatives, one of which is disclosed in the German patent application DE-A 195 40 086 to have a bleach-stabilizing effect besides their cobuilder properties. Other suitable builders are polyacetals which may be obtained by reaction of dialdehydes with polyol having 5 to 7 carbon atoms and at least 3 hydroxyl groups, for example as described in European Patent Application EP-A 0 280 223. Preferred polyacetals are obtained from dialdehydes such as glyoxal, glutaraldehyde, Terephthalal- dehyd and mixtures thereof and from polyol such as gluconic acid and / or glucoheptonic. The oxidized derivatives of such dextrins are their reaction products with oxidizing agents which are capable of oxidizing at least one alcohol function of the saccharide ring to the carboxylic acid function. Such oxidized dextrins and processes for their preparation are, in particular from European patent applications EP-A 0232202, EP-A 0427349, EP-A 0472042 and EP-A 0542496 and from International Patent Applications WO 92/18542 WHERE 93/08251, WO 93/16110, WO 94/28030, WO 95/07303, WO 95/12619 and WO 95/20608 known. Also suitable is an oxidized oligosaccharide according to the German patent application DE-A 196 00 018 A product oxidized at Cβ of the saccharide may be particularly advantageous. Oxydisuccinates and other derivatives of disuccinates, preferably E thylendiamindisuccinat further suitable cobuilders. In this case, ethylenediaminetetraacetic-N, N'-disuccinate (EDDS), whose synthesis is described for example in the document US-A 3,158,615, preferably in the form of its sodium or magnesium salts. Furthermore, in this context, are also preferred glycerol disuccinates and glycerol, as described for example in US patents US-A 4,524,009 and US-A 4,639,325, in the European patent application EP-A 0,150,930 and in Japanese Patent Application JP-A 93 / 339.896 to be discribed. The quantities used in zeolite-containing and / or silicate-containing formulations are from 3 to 15 wt .-%. Other useful organic co-builders are, for example, acetylated hydroxycarboxylic acids and salts thereof, which may optionally be present in lactone form and which contain at least 4 carbon atoms and at least one hydroxyl group and at most two acid groups. Such co-builders are described, for example in the international patent application WO 95/20029. Another class of substances with co-builder properties are the phosphonates is nate. This is particularly hydroxyalkane and aminoalkanephosphonates. Among the hydroxyalkane, 1-hydroxyethane-1, 1-diphosphonate as co-builders (HEDP) is particularly important. It is preferably used as the sodium salt, the disodium neutral reaction and the tetrasodium salt an alkaline reaction (pH = 9). Aminoalkanephosphonates preferably ethylenediamine (EDTMP), diethylenetriamine (DTPMP) and higher homologs thereof are suitable. They are preferably used in the form of the neutrally reacting sodium salts, for example as the hexasodium salt of EDTMP or as the hepta- and Octanatri- umsalz of DTPMP. Of the class of phosphonates, HEDP is preferably used as a builder. The aminoalkanephosphonates have a pronounced heavy metal binding capacity. Accordingly,, particularly if the inventive washing or cleaning agent portions also contain bleach be preferred aminoalkanephosphonates particular use or DTPMP to use πaten mixtures of said phospholipids. In addition, any compounds which are capable of forming complexes with alkaline earth metal ions are used as co-builders can. Besides the constituents mentioned surfactant and builder detergents or the inventive cleaning compositions may ren further customary in detergents or cleaners ingredients from the group of the bleaches, bleach activators, enzymes, perfumes, perfume carriers, fluorescers, dyes, Schauminhibito-, silicone oils, antiredeposition agents, optical brighteners , Vergrauungsinhibito- reindeer, contain color transfer inhibitors and corrosion inhibitors. Nonenylamidoperadipic acid and N-Nonenylamidoper-succinate; and (c) aiipha- diagram and araliphatic peroxydicarboxylic acids, such as 1, 12-diperoxycarboxylic acid, 1, 9-diperoxyazelaic acid, Diperocysebacinsäure, diperoxybrassylic acid, the di- peroxyphthalsäuren, 2-decyldiperoxybutane-1, 4-dioic acid, N, N-di-Terephthaloyi (6 aminopercaproic) can be used. As bleaching agents in compositions for machine dishwashing and chlorine or bromine-releasing substances. Suitable chlorine- or bromine-releasing materials, for example, heterocyclic N-bromo and N-chloroamides, for example, trichloroisocyanuric acid, tribromoisocyanuric, dibromoisocyanuric and / or dichloroisocyanuric come (DICA) and / or their salts with cations such as potassium and sodium. Hydantoin compounds such as 1, 3-dichloro-5,5-dimethylhydantoin are also suitable. In order to obtain washing or cleaning at temperatures of 60 ° C and below, an improved bleaching effect, bleach activators can be incorporated into the laundry detergent and cleaning composition portions. Suitable bleach activators are compounds which form aliphatic peroxocarboxylic acids under perhydrolysis conditions, with preferably 1 to 10 C atoms, in particular 2 to 4 C-atoms, and / or optionally substituted perbenzoic acid, can be used. Suitable substances which carry O- and / or N-Acyigruppen of said number of carbon atoms and / or optionally substituted benzoyl groups. Preferred are multiple acyiierte alkylenediamines, in particular Tetraacetylethy- diamine (TAED), acyiierte triazine derivatives, especially 1, 5-diacetyl-2,4-dioxohexahydro-1, 3,5-triazine (DADHT), acyiierte Glykoluriie, in particular tetraacetylglycoluril (TAGU), N-acylimides, in particular N-nonanoylsuccinimide (NOSI), acyiierte phenolsulfonates, in particular n-nonanoyl- or Isononanoylo- xybenzolsulfonat (n- or iso-NOBS), carboxylic anhydrides, more particularly phthalic anhydride, acyiierte polyhydric alcohols, especially triacetin, ethylene glycol diacetate and 2, 5-diacetoxy-2,5-dihydrofuran. In addition to the conventional bleach activators or instead of them, so-called bleach catalysts can be incorporated into the detergent and cleaning portions. These substances are bleach-boosting transition metal salts or transition metal complexes such as Mn, Fe, Co, Ru - or Mo salt complexes or -carbonylkomple-xe. Also, Mn-, Fe-, Co-, Ru-, Mo-, Ti-, V- and Cu-complexes with N-containing tripod ligands and Co-, Fe-, Cu- and Ru-ammine complexes may also be used as bleach catalysts. Suitable enzymes are those from the class of proteases, lipases, amylases, cellulases and mixtures thereof in question. Particularly suitable are from bacterial strains or fungi, such Baciilus subtilis, Bacillus licheniformis and Streptomyces griseus tomyces Enzymatic active substances obtained. Preferably, proteases of the subtilisin type and especially proteases produced from Bacillus len tus used. Enzyme mixtures, for example of protease and amylase or protease and lipase or protease and cellulase or of cellulase and lipase or of protease, amylase and lipase or protease, lipase and cellulase, but especially cellulase-containing mixtures are of particular interest. Peroxidases or oxidases have also proven suitable in some cases. The enzymes may be adsorbed onto supports and / or encapsulated in membrane materials to protect them against premature decomposition. The proportion of enzymes, enzyme mixtures or enzyme granules in the present compositions can, for example, about 0.1 to 5 wt .-%, preferably 0.1 to about 2 wt .-%. The washing or cleaning composition portions according to the invention contain, according to a particularly preferred embodiment, further additives, as are known from the prior art as additives for washing or cleaning agent preparations. These can be either one or more, including all sub-portions (detergent-active preparations) of the inventive washing or cleaning composition portions may be added if needed or - as described in co-pending Patent Application No. 199 29 098.9 entitled "drug sachet". - be incorporated in the water-soluble, comprising the active washing preparations materials, so for example, the water-soluble films, but also in the inventive capsules or coatings. A preferred group used in the invention additives are optical Aufheiler. can be used here in the usual Waschmittein optical brighteners. These are added as an aqueous solution or as a solution in an organic solvent of the polymer solution, which is converted into the film or a partial portion (washing-active preparation) are added to a washing or cleaning agent in solid or liquid form. Examples of optical brighteners are derivatives of diaminostilbenedisulfonic acid or alkali metal salts. Suitable z. For example, salts of 4, 4'-bis (2-anilino-4- moφhoiino1,3,5-triazinyl-6-amino) stilbene-2,2'-disulfonic acid or compounds of similar structure, instead of the morpholino group is a carry diethanol- amino group, a methylamino group, an anilino group or a 2- methoxyethylamino group. Brighteners of the substituted diphenyl type in the part portions (detergent-active preparations) of the inventive washing or cleaning composition portions be contained, z. B. the Aikalisalze of 4,4'-bis (2-sulfostyryl-) biphenyl, 4,4'-bis (4-chloro-3- sulfostyryl-) diphenyl or 4- (4-Chlorstyryl-) 4 '- (2 -sulfostyryl-) biphenyl. Mixtures of the brighteners can be used. Another inventively preferred group of additives are UV protective substances. These are substances that are released during the washing process or in the subsequent Weichspülprozeß in the wash liquor and accumulate accumulative on the fiber, and then to achieve a UV protective effect. Suitable products from Ciba Specialty Chemicals located under the name Tinosorb are commercially available. Other possible and preferred in particular embodiments additives are foam inhibitors, but also bitter substances that can prevent accidental ingestion of such packages or parts of such Veφackungen of children. Another preferred group of additives according to the invention are dyes, particularly wasseriösliche or water-dispersible dyes. Preferred dyes, such as are commonly used to improve the optical product anmutung in detergents and cleaning agents are here. The selection of such dyes are no difficulties to the expert, especially since such conventional dyes have high storage stability and Unempfindiichkeit compared with the other ingredients of the wash-active preparations and Towards the light, and no pronounced affinity for textile fibers so as not to stain. The dyes according to the invention are present in the detergents or cleaning composition portions in amounts of less than 0.01 wt .-%. A further class of additives which the washing or cleaning composition portions may be added according to the invention are polymers. Suitable polymers are, on the one hand, polymers that show when washing or cleaning or rinsing cobuilder properties, that is, for example, polyacrylic acids, polyacrylic acids, modified or corresponding copolymers. Another group of polymers are polyvinyl pyrrolidone and other Vergrauung- sinhibitoren as like copolymers of polyvinyl pyrrolidone, cellulose ethers and. According to a further embodiment of the invention, so-called soil repellents as polymers in question. Are the polymers which attach to fibers or hard surfaces, and there counteract resoiling. Relevant compounds of this type are known in the detergent art. It is the polyester of ethylene and Terephthaisäure lenglykois, which are partially modified with sulfonic acid groups. A further group of additives are bleach catalysts, bleach catalysts particularly for machine dishwashing detergents or laundry detergents. It uses only complexes of manganese and cobalt, especially with nitrogen-containing ligands. A further preferred for the purposes of the invention, group of additives are silver protection agents. It is here to a plurality of most cyclic organic compounds which are known to the skilled person addressed here also and contribute to the tarnishing of silver-containing articles to prevent the cleaning process. As a further inventive additives, the washing or cleaning composition portions may also contain components that positively influence the oil and Fettauswasch- bility of textiles, so-called soil repellents. This ef- becomes particularly clear when a textile which fect that has already been previously washed several times with an inventive detergent containing this oil- and fat-dissolving component. Preferred oil- and fat-dissolving components include, for example, nonionic cellulose ethers such as methylcellulose, and methylhydroxypropylcellulose having a proportion of metal thoxy groups of from 15 to 30 wt .-% and of hydroxyprop-oxyl groups of 1 to 15 wt .-% , in each case based on the nonionic cellulose ether, and lenterephthalaten known from the prior art polymers of phthalic acid and / or terephthalic acid or derivatives thereof, more particularly polymers of ethylene and / or polyethylene glycol terephthalates or anionically and / or nonionically modified derivatives thereof , Especially preferred of these, the sulfonated derivatives of phthalic acid and terephthalic acid polymers. All of these additives are the inventive washing or cleaning composition portions in amounts of up to at most 30 wt .-%, preferably 2 to 20 wt .-%, is added. As already said, the additive can also be effected for a material of a water soluble enclosure, comprising the or one of the detergent active (s) preparation (s). In order to obtain the balance of the formulation, it is therefore possible for the skilled man to increase the plastic material for the enclosure either in its weight, so as to utilize the depot effect is achieved according to the invention, or said additives additionally at least partly in the keep remaining washing formulation. This is less preferred. Fragrances are the washing and cleaning agent according to the invention added portions to improve the overall aesthetics of the products and to provide a sensory typical and unmistakable product available to the consumer in addition to the technical performance (Weichspülergebnis). The usable in the inventive washing or cleaning composition portions fragrances and perfume preparations (perfumes) have been broadly described above. Typically, the content of fragrances in the range up to 2 wt .-% of the total laundry detergent or cleaning composition portion. The fragrances can be incorporated directly into the washing-active preparations; but it can also be advantageous to apply the fragrances to carriers which enhance the adhesion of the perfume to the laundry and by slower fragrance release ianganhaltenden fragrance of the textiles. Suitable carrier materials are, for example, cyclodextrins have proved. The cyclodextrin-perfume complexes to be additionally coated with further auxiliaries. The perfumes and fragrances can (detergent preparations) of the inventive detergent or cleaner portions contain basically in each of the sub-portions. It is particularly preferred, however, that, in a detergent in a recess provided for the Nachwaschgang or Weichspüigang partial laundry detergent portion or in a detergent, particularly in a dishwashing detergent in a recess provided for the rinse cycle or rinse cycle part cleaning composition portion especially part-detergent portion, are included. They must therefore according to the invention by a only when the conditions (in particular at the temperature) of the Nachwaschgangs or post-spüigangs water-soluble (particularly in the temperature) of the preceding washes or rinses the water-insoluble material in the conditions, in particular of a corresponding film or capsule be comprised. According to the invention this is feasible, for example, with an existing multi-chamber bag made of films of varying water solubility. The washing and inventive cleaning composition portions can be in a number of different configurations. can designs such training depend on those used in the individual components, in particular the washing-active preparations, but can be freely selected within certain limits. So are numerous detergent-active preparations in the form of powders, powder mixtures or in the form of particulate Köφer, for example beads or granulate late.vor so that it lends itself detergents and cleaning agents portions according to the invention as a single-serving packs or packages of combinations powdery or provide particulate components, for example, as combinations of pulverulent or particulate components in foil pouches with one or more chambers or layers or as portions or combinations of pulverulent components in capsules. According to another preferred embodiment of the invention, the solid, for example pulverulent, components are processed into granules or beads, and in the form of granules or beads - comparable to the powders - in bags from film with multiple layers or chambers or in capsules be veφackt, the form in which they come directly to the washing or cleaning used. - a detergent composition in the form of a (optionally solvent delayed) molded article with a trough, in which a further wash-active preparation in the form of a molded body is held by a water-soluble polymer material a certain temperature; by adjusting the solubility of the second molded article can, in certain conditions (for example, certain temperature.) dose-soluble components in the wash liquor; - more detergent-active preparations in the form of (optionally solvent delayed) molded body are summarized in water-soluble polymer materials having different solubility in water to a washing or cleaning agent portion, optionally together with other components in other water-soluble (at different conditions) polymer materials. As stated above, these cases represent non-limiting examples of laundry detergent or cleaner portions according to the invention. - comprises at least a measured amount of at least one washing-active preparation with the at least one water-soluble polymer material. The process steps are dependent on whether a measured quantity or whether a plurality of measured quantities of detergent active compositions are contained in the produced detergent or cleaning composition portion in detail. In principle the method is suitable for the preparation of a washing-active preparation extensive washing or cleaning composition portions or more detergent-active preparations extensive washing or cleaning agent portions. The second-mentioned case, the inventively preferred: Regularly washing or cleaning composition portions are prepared in which more detergent-active preparations are combined to form one portion. In the simplest case of preparing each detergent composition is surrounded by a separate water-soluble polymeric material. However, it is also to include more detergent-active preparations with a polymeric material possible. The respective water-soluble polymeric material must be selected in the inventive production process thereafter, the temperature at which dissolve the particular polymer material in the washing or cleaning liquor and thus to release the contents of the Teilveφackung to the fleet. However, a further criterion for the selection of the water-soluble polymer material according to the invention, which washing-active preparation of the respective polymeric material comprises should be. This is therefore of importance because then directs the decision soft component (s) of the washing-active preparation, to their "packaging" is intended the polymeric material should also be included in the polymer material (s) or alternatively or additionally which compo- nent (s) of the water-soluble polymer material to be contained in the washing-active preparation (s). According to the invention (s), that is a water-soluble polymer material is provided at least for the detergent (s) preparation, which contains one or more compo- nent (s) that is included in at least one of the comprised active washing formulations. Alternatively or simultaneously, or one or more detergent-active preparations are compounded so that they contain at least or even several component (s) of this extensive water-soluble polymer material. optionally less on the addition amounts (wt <20 - particularly preferably one or more of the components that are included in both phases (polymer material (s) and wash-active preparations)) selected from the group consisting of hydrophilic plasticizers and substances. -%, advantageously <10 wt .-%, based on the formulation) of water - at room temperature are liquid or pasty to waxy. Particularly preferred are those mentioned above, most preferably the surfactant components specifically described above or polyols, polyalkylene glycols and structurally analogous A- mine. Of these, one or more be present in both phases. The content of one or more of said components is selected in the process of the invention so that it corresponds to in each of the phases of the respective concentration of the phase equilibrium. Thus, both phases from the beginning, can be in a mutual dynamic exchange of the respective component (s). However, it corresponds to a further embodiment of the invention, the concentration of the component (s) to be selected such that a phase containing the predominant amount, or even the total amount of the respective component (s) and the other phase contains a minor amount of the same component or not even includes the candidate (s) component (s) when the balance between the two phases involved adjusts detergent composition and water-soluble polymer material according to the preparation of the inventive detergent or cleaning composition portion under controlled conditions. By diffusion and / or Adsoφtion the candidate component (but not limited to) then migrates example, in hours or a few days into the phase in which the concentration is below the phase equilibrium concentration. Thus, after a short, set the phase equilibrium for the practice acceptable time, and there are thus both stable detergent formulations and stable in storage enclosures of the washing preparation (s) obtained in combination. It is of course also possible within the framework of the manufacturing process according to the invention to include more detergent-active preparations with a water soluble polymeric material. Examples of this have been mentioned above. In this case, the polymer material may contain one or more components of one or more washing-active substances, as well as several substances active at washing may include one or more components of the polymeric material alternatively or simultaneously. The invention also relates to the new enclosures for the inventive washing or cleaning composition portions. These enclosures are particularly suitable for embracing the inventive washing or cleaning composition portions or their partial portions. In this case, these enclosures are either designed so that one or more component (s) at least one of (covered later) detergent-active preparations is also contained in the water-soluble polymer material of the enclosure / are or that one or more component (s) of the water-soluble polymer material in at least one of (covered later) detergent-active preparations is / are. to realize preferred according to the invention is also an embodiment in which both one or more Komponeπte (s) at least one of the wash-active preparations is also contained in the water-soluble polymeric material is / are and wherein one or more compo- nent (s) of water-soluble polymeric material is also contained in at least one of the wash-active preparations / are. is in accordance with preferred and usable advantageously embodiments of the enclosures / are the component (s), which is also contained in the water-soluble polymeric material is / are selected from the group of substances which - optionally low in additive amounts of water - liquid at room temperature or pasty to waxy present. Especially preferred is the invention according to an embodiment of the enclosures according to the invention, in which the contained also in the water-soluble polymer material (s) component (s) at least one of the wash-active preparations) is / are selected from the group consisting of non-ionic and anionic surfactants, as they have been defined in detail above. More preferred are the present invention non-ionic surfactants from the group alkoxyiierte fatty alcohols having 8 to 20 carbon atoms in the fatty alcohol radical, wherein fatty alcohols of natural origin, ie straight and regularly predominantly an even number of carbon atoms in the alkyl group-containing fatty alcohols, to synthetic Fettalkohoien (eg. B. branched or an odd number of carbon atoms containing fatty alcohols) are preferred. Examples of the fatty alcohols from the viewpoint of availability of the compounds of lauryl alcohol (C 1 2), myristyl (C14), cetyl alcohol (Cι 6), etc. or originating from na- ven sources and correspondingly processed mixtures of such fatty alcohols. The number of alkoxy groups, are used as soft invention primarily ethoxy groups or propoxy groups in question, particularly preferably ethoxy, can vary within wide limits and is preferably between 3 and 80. Further nonionic surfactants which in the water-soluble polymer material may be included in the present invention are alkoxyiierte C 8 - to C 20 - fatty acid alkyl ester having 1 to 8 carbon atoms in the alkyl radical and 3 to 80, particularly preferably up to 20, alkoxy groups, preferably ethoxy groups in the molecule. From a practical point of view will be taken into account advantage that such compounds from the above groups are used, which are still liquid to pasty even with larger chain lengths at the application temperatures. It can be inventively used for the stated purpose and anionic surfactants. From the group of these compounds, alkyl benzene sulfonic acids are primarily having 9 to 13 carbon atoms in the alkyl groups and their (predominantly voriiegenden in alkaline medium) salts, cumene sulfonic acid and its salts, Cι 2 - to Cι 8 - fatty alcohol sulfates and C 8 - to C 20 - fatty acids and their salts. Further particularly preferred according to the invention an embodiment of the enclosures for washing or cleaning composition portions in which the given also in at least one washing-active preparation (s) component (s) is selected the water-soluble polymeric material is / are from the group of hydrophilic plasticizer. Particularly preferred polyols having 1 to 20 carbon atoms and 2 to 6 hydroxyl groups, polyalkylene glycols having 2 to 4 (preferably linear) alkylene carbon atoms (ie, ethylene groups, Propyien groups or Butyien groups) in the molecule, particularly preferably polyethylene glycols and erfindungungsgemäß / or polypropylene glycols, more particularly preferably poly-ethylene glycols and / or polypropylene glycols having molecular weights ranging from 200 to 12,000 more preferably having molecular weights of <1,500. Also useful are advantageously the aforementioned polyalkylene glycols structurally analogous amines, that is compounds in which the glycol is replaced by an amine group -O- -NH- group. Also for the amines, the ranges stated above, the molecular weights apply. From a practical standpoint, such compounds are advantageously used in the inventive enclosure can be used which are still liquid to pasty at the (higher) operating temperatures. According to another preferred embodiment of the invention, low molecular weight polyacrylates or polymethacrylates or polymaleates can (acids or - in the alkaline conditions of use, preferably salts thereof, including their amine or (organic) ammonium salts) or copolymers are used from polyacrylates / polymethacrylates and Polymaleinaten. As already indicated above, the concentrations of the respective component are com- (s) in the inventive enclosure hardly restricted, however, depend on a number of parameters. In general, the phase equilibrium concentration in the enclosure is from 0.5 to 50 wt .-%, aeration subjected to the total weight of the material of the enclosure, preferably from 1 to 30 wt .-%, and more preferably 3 to 25 wt .-%. In the instance mentioned above, that in the production of the washing or cleaning composition portion embracing not contain any of the desired components, of course, the concentration may be at the beginning of the production step 0 wt .-%. However, it is set later in the course of a controllable, relatively short period of time a phase-equilibrium concentration of the corresponding component (s) in the enclosure corresponding to a concentration in the above mentioned areas. More preferably it is according to the invention in that the material of the enclosure is a polymer material which is selected from the group consisting of (optionally acetalized) polyvinyl alcohol, polyvinylpyrrolidone, polyethylene oxide, gelatin, starch, cellulose and derivatives thereof and mixtures thereof. Details of these materials have been given above. With particular advantage according to the invention water-soluble polymer materials are used, which are present in the form of sheets, capsules or coatings. Details of these forms were also discussed above in connection with the washing or cleaning composition portions. encompassed by the invention are further a washing method using the above-mentioned laundry detergent portions as well as a cleaning method using the above-benenen cleaner portions. In both methods, enclosures and wrappings are used, in which one or more component (s) at least one of (later included) detergent-active preparations is also contained in the water-soluble polymer material of the enclosure / and / or in which one or more component (n) of the water-soluble polymer material in at least one of (covered later) detergent-active preparations is / are. - by further addition of water (n) and adjusting the temperature to one or more other (s) temperature value (s) of / is cheap to the first temperature value and is optionally further previous temperature / are one or more further detergent-active preparations in the wash water releases. - by further addition of water (n) and adjusting the temperature to one or more other (s) temperature value (s) of / is higher than the first temperature value and is optionally further previous temperature values ​​/ are one or more further detergent-active preparations in the cleaning liquor releases. The washing or cleaning process is thus aimed at an optimal condi- tioning of the washing or cleaning solution to achieve this by appropriate washing or cleaning composition portions in conditions in the first place and thus preferred: released in temperature conditions in the fleet advertising to, which make it possible to develop the properties of the released active washing preparation optimized words, in the staggered (first, second and possibly higher) temperatures of the respective washing or purification steps. With the present invention, therefore, the washing or cleaning agent are suitable enclosures portions and provided for the enclosure, containing a component in at least the envelopes contained in one of the wash-active preparations of the washing or cleaning composition portions and / or containing a component in at least one washing-active formulation of the washing or cleaning composition portions at least contained in an enclosure forming a water-soluble polymer material. This not only ideal Veφackungs- bzw- encirclement yield materials for detergent formulations, but also practical and convenient for the consumer to dose detergent or cleaning composition portions with respect to the prior art, improved properties. 1. Washing or cleaning composition portion, in particular for feeding a washing or dishwashing machine for a take place in an aqueous phase program run containing at least a measured amount of at least one detergent active composition and at least one metered (s) amount (s) of at least a washing-active preparation complete water-soluble polymer material, wherein one or more compo- nent (s) of the detergent active compositions are contained in at least the water-soluble polymer material. 2. Washing or cleaning composition portion, in particular for feeding a washing or dishwashing machine for a take place in an aqueous phase program run containing at least a measured amount of at least one detergent active composition and at least one metered (s) amount (s) of at least a washing-active preparation complete water-soluble polymer material, wherein one or more compo- nent (s) of the water-soluble polymer material are also contained in at least one of the wash-active preparations. 3. Washing or cleaning composition portion, in particular for feeding a washing or dishwashing machine for a take place in an aqueous phase program run containing at least a measured amount of at least one detergent active composition and at least one metered ^) amount (s) at least one washing-active preparation comprehensive water-soluble polymer material, wherein one or more component (s) of the detergent-active preparations are at least included in the water-soluble polymer material, and wherein one or more component (s) of the water-soluble polymer material in at least one of the wash-active preparations are included. 4. Washing or cleaning composition portion according to one of claims 1 or 3, wherein the contained also in the water-soluble polymer material (s) compo- nent (s) is selected at least one of washing-active preparation (s) is / are selected from the group of substances - are present at room temperature liquid or pasty to waxy - optionally with the addition of small amounts of water. 5. Washing or cleaning composition portion according to claim 4, wherein the compo- nent (s) is / are selected from the group consisting of alkoxylated fatty alcohols having 8 to 20 carbon atoms and 3 to 80 alkoxy groups, more preferably ethoxy groups in the molecule alkoxylated C 8 - to C 2 o -Fettsäureal- alkyl esters having 1 to 8 carbon atoms in the alkyl radical and 3 to 80, preferably up to 20 alkoxy groups, more preferably ethoxy groups in the molecule, C 9 - to C 13 - alkyl sulfonates, cumene sulfonate, Cι 2 - to C-ι 8 - Fettalkohoisulfaten and salts of C 8 - to C 2 o - fatty acids. 6. Washing or cleaning composition portion according to one of claims 2 or 3, wherein the given also in at least one washing-active preparation (s) component (s) is selected the water-soluble polymeric material is / are selected from the group of hydrophilic plasticizer. 7. Washing or cleaning composition portion according to claim 6, wherein the compo- nent (s) is / are selected from the group polyols having 1 to 20 carbon atoms and 2 to 6 hydroxyl groups, polyalkylene glycols having 2 to 4 carbon atoms in the alkylene radical, and structurally analogous amines -NH- groups instead of the -O- groups in the molecule, preferably polyethylene glycols and polypropylene glycols or structurally analogous amines, more preferably polyethylene glycols and polypropylene glycols having molecular weights in the range of 200 to 12,000, respectively strukturanaioge amines, still more preferably respectively with molecular weights of <1,500 . structurally analogous amines. 8. Washing or cleaning composition portion according to one of claims 1 or 3, wherein the contained also in the water-soluble polymer material (s) compo- nent (s) is selected at least one of washing-active preparation (s) is / are selected from the group of perfumes and fragrance compounds. 9. Washing or cleaning composition portion according to claim 8, wherein the compo- nent (s) is / are selected from the group of synthetic fragrance compounds of the type esters, ethers, alcohols, hydrocarbons and / or mixtures thereof, and natural odorant mixtures, as are obtainable from plant sources. 10. Washing or cleaning composition portion according to one of claims 1 to 9, wherein the component (s) in the at least one water-soluble polymer material and the at least one detergent active composition in a corresponding to the equilibrium concentration is present / vorlie gene, preferably in a concentration of 0.5 to 50 wt .-%, based on the total weight of the respective phase, more preferably in a concentration of 1 to 30 wt .-%, most preferably in a concentration of 3 to 25 parts by weight %. 11. Washing or cleaning composition portion according to one of claims 1 to 9, wherein the component (s) in the in the at least one active washing formulation in an above and below the concentration corresponding to at least one water-soluble polymer material and the equilibrium lying concentration is / are present and corresponding to the equilibrium concentration obtained within a controlled time, preferably a concentration of 0.5 to 50 wt .-%, based on the total weight of the respective phase, even more preferably a concentration of 1 to 30 weight .-%, most preferably a concentration of 3 to 25 wt .-%. 12. Washing or cleaning composition portion according to one of claims 1 to 11, wherein the water soluble polymer material is selected from the group consisting of (optionally acetalized) polyvinyl alcohol, polyvinylpyrrolidone, Poiyethylenoxid, gelatin, starch, cellulose and its derivatives and mixtures thereof. 13. Washing or cleaning composition portion according to one of claims 1 to 12, wherein the water soluble polymer material is in the form of sheets, capsules or coatings. 14. Washing or cleaning composition portion according to one of claims 1 to 13, additionally comprising an enclosure, which is less permeable to water vapor and / or for the component (s) as the polymer material. 16. Washing or cleaning composition portion according to one of claims 14 or 15, wherein the enclosure is reclosable. 17 embracing at least a measured quantity of a washing-active formulation of a suitable in particular for feeding a washing or dishwashing machine washing or cleaning composition portion in the form of a water-soluble polymeric material, wherein one or more compo- nent (s) at least one of the wash-active preparations also contained in the water-soluble polymeric material is / are. 18 embracing at least a measured quantity of a washing-active formulation of a particular for feeding a washing or dish washer suitable washing or cleaning composition portion in the form of a water-soluble polymeric material, wherein one or more compo- nent (s) of the water-soluble polymer material is contained in at least one of the wash-active preparations / are. 19 embracing at least a measured quantity of a washing-active formulation of a suitable in particular for feeding a washing or dishwashing machine washing or cleaning composition portion in the form of a water-soluble polymeric material, wherein one or more compo- nent (s) at least one of the wash-active preparations also contained in the water-soluble polymer material / and wherein one or more component (s) is the water-soluble polymer material in at least one of the wash-active preparations / are. 20. enclosure according to any one of claims 17 or 19, wherein the given also in the wasseriöslichen polymer material is selected component (s) (n) at least one of the wash-active preparation (s) is / are from the group of substances which - optionally at addition of small amounts of water - there are liquid at room temperature or pasty to waxy. 21. enclosure according to claim 20, wherein the component (s) is / are selected from the group consisting of alkoxylated fatty alcohols having 8 to 20 carbon atoms and 3 to 80 alkoxy groups, more preferably ethoxy groups in the molecule, alkoxylated C 8 - to C 20 -Fettsäurealkyiestern having 1 to 8 carbon atoms in the alkyl radical and 3 to 80, preferably up to 20 alkoxy groups, more preferably ethoxy groups in the molecule, C 9 - to C 13 - alkyl sulfonates, cumene sulfonate, C 12 - to Cι 8 - fatty alcohol sulfates and salts of C 8 - to C 2 0 - fatty acids. 22. enclosure according to any one of claims 18 or 19, wherein the given also in at least one washing-active preparation (s) is component (s) selected of the water- soluble polymeric material is / are selected from the group of hydrophilic plasticizer. 23. enclosure according to claim 22, wherein the component (s) is / are selected instead of the group polyols having 1 to 20 carbon atoms and 2 to 6 hydroxyl groups, polyalkylene glycols having 2 to 4 carbon atoms in the alkylene radical, and structurally analogous amines with -NH- groups the -O- groups in the molecule, preferably Polyethylengiykole and polypropylene glycols or structurally analogous amines, more preferably Polyethylengiykole and polypropylene glycols having molecular weights in the range of 200 to 12,000, respectively structurally analogous amines, more preferably having molecular weights of <1,500 or structurally analogous amines. 24. enclosure according to any one of claims 17 or 19, wherein the contained also in the water-soluble polymeric material is selected (s) component (s) at least one of washing-active preparation (s) is / are from the group of fragrances and fragrance compositions. 25. enclosure according to claim 24, wherein the component (s) is / are selected from the group of synthetic fragrance compounds of the type esters, ethers, alcohols, hydrocarbons and / or mixtures thereof, and natural odorant mixtures, as are known from are available plant sources. 26 enclosure according to any one of claims 17 to 23, including the compo- te (n) in a corresponding to the equilibrium concentration, preferably in a concentration of 0.5 to 50 wt .-%, based on the total weight of Polymeφhase, more preferably in a concentration of 1 to 30 wt .-%, most preferably in a concentration of 3 to 25 wt .-%. 27 enclosure according to any one of claims 17 to 23, including the compo- te (n) in an above and below the concentration corresponding to the equilibrium state, lying concentration, whereby corresponding to the equilibrium concentration obtained within a controlled time, preferably a concentration of 0.5 to 50 wt .-%, based on the total weight of Polymeφhase, even more preferably a concentration of 1 to 30 wt .-%, most preferably a concentration of 3 to 25 wt .-%. 28 enclosure according to any one of claims 17 to 27, wherein the water-soluble polymeric material is selected from the group consisting of (optionally acetalized) polyvinyl alcohol, polyvinylpyrrolidone, polyethylene oxide, gelatin, starch, cellulose and its derivatives and mixtures thereof. 29 enclosure according to any one of claims 17 to 28, wherein the water-soluble polymer material is in the form of sheets, capsules or coatings. - by further addition of water (n) and adjusting the temperature to one or more other (s) temperature value (s) of / is higher than the first temperature value and is optionally further previous temperature values ​​/ are one or more further detergent-active preparations in the washing liquor releases. ES2219034T3 (en) 2004-11-16 Composition of washing and cleaning portions. ES2284890T3 (en) 2007-11-16 aqueous dishwashing agent &#34;3 in 1&#34;. ES2252286T3 (en) 2006-05-16 Hollow bodies with compartments, containing a portion of textile detergent, dishwashing cleaning. ES2252027T3 (en) 2006-05-16 Portion of detergent or cleaning agent. ES2279967T3 (en) 2007-09-01 A water soluble package.